The Marvel Cinematic Universe is unique in cinematic history; aside from the largely continuity-free Bond movies, never has a major movie arrived so confident in its ability to jump into the midst of a story with, not only no backstory or introduction, but no need to pretend. Avengers isn't a mere third instalment of successful action team-ups, it's the 19th in a linked narrative that has sustained remarkably well over the last decade. Infinity War is the culmination of a villain arc first teased in The Avengers, when the powerful Thanos is revealed to be behind that movie's attack on New York City. Thanos (Josh Brolin) is on a quest is to save the universe from its denizens' own avarice — regardless of species or planet, Thanos believes, we're an overpopulated universe to be saved only by a massive cull: say, 50 percent. Kill half of everyone everywhere and the remainder will thrive is his demented thinking. To amass enough power to achieve this on a universal scale, he seeks six infinity stones — rocks of magic that control space, time, reality, soul, mind and power. As the action begins, Dr. Strange (time) and the Vision (mind) have two of the stones; the rest of the Avengers attempt to stop Thanos from acquiring any of them. The film opens with the aftermath of Thor: Ragnarok and the fate of the Asgardians; having fled the planet's destruction, the survivors, including Thor (Hemsworth), Loki (Tom Hiddleston) and Heimdall (Idris Elba) are beset by Thanos. Meanwhile on Earth, the rest of the Avengers, following the events of Captain America: Civil War, have scattered, the trust broken between missing-in-action Captain America (Chris Evans) and Tony Stark (Robert Downey Jr). The action that commences will, respectfully, be left for fans to discover, but directors Anthony and Joe Russo — the best of the MCU directors, having helmed all the Captain America movies, taking over from Avengers director Joss Whedon — make a few smart choices with the assembled heroes. The primary one is to split them into working groups for much of the film, and the interplay between friends and new acquaintances adds a fair amount of freshness to character traits that are, in some cases, well worn by now. 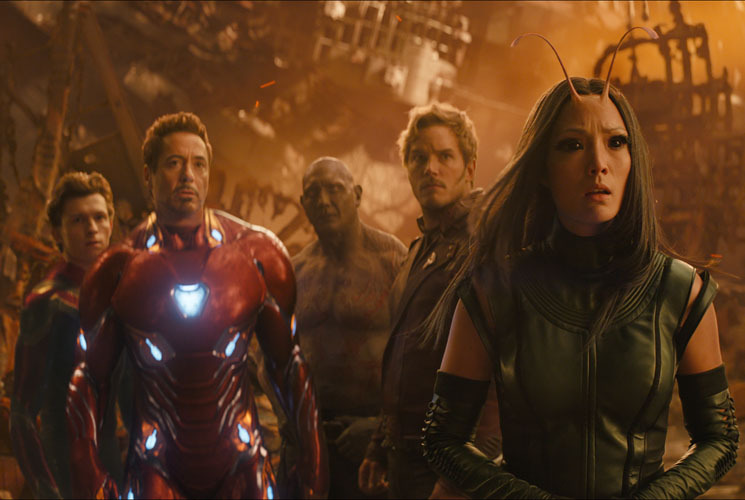 The Guardians of the Galaxy, for example, have strong ties to Thanos — Gamora (Zoe Saldana) is, after all, a step-daughter of sorts — yet have no previous connection to the larger Avengers team, so there's some delight in having Star-Lord (Chris Pratt) argue that, in fact, his plan is better than stupid Tony Stark's. Spider-Man (Tom Holland) gets to feel part of the team, even as he quips, mid-fight, that he can't remember everyone's name. Separating and re-teaming members succeeds because 18 movies' worth of character work has led them here; the quirks of Dr. Strange (Benedict Cumberbatch) don't need context — Infinity War smartly proceeds as if no one needs an MCU refresher. And given the kind of insane roster of recognizable characters at play — we haven't even mentioned Elizabeth Olsen's Scarlet Witch, Scarlett Johansson's Black Widow, Pom Kementieff's Mantis or Sebastian Stan's Bucky Barnes — it's no big deal that they yadda-yadda the absence of "Scott and Clint" (Ant-Man and Hawkeye). The finale, inevitable gathering of the willing takes place in Wakanda over the film's final quarter, bringing the Black Panther universe fully into the larger Avengers one, and while only T'Challa (Chadwick Boseman), Okoye (Danai Gurira) and Shuri (Letitia Wright) are given much to do, it's thrilling to finally unify the most interesting aspects of the MCU.